1. Spectacle or no spectacle? He states that he has found the spectacles tend to catch weapons and guide them to the wearer's eyes. I notice though, that the one he shows has rather largish holes. Can anyone who has actually used helmets with spectacles better explain this to me? Can I make the eye-holes smaller and eliminate this problem? Is there not really that much of a problem? The one shown also has cheek-guards, but a search of the forums brought up some discussions that suggest that "Viking" helmets lack cheek-guards. However, this guy certainly seems to think they existed and even talks about a bit of a saga in which they mention cheek-guards (although I understand the sagas were written like a 100 years after the events, so I could see where things could easily be added or omitted with wild abandon). So, how far would I be stretching things to throw in cheek-guards? 1. Spectacles are fine. What the proponents of this quaint, Ivory Tower theory fail to consider is this: how much "safer" is it to have, say, a spear thrust into your face when you're *not* wearing a helmet? That the blade now pierces your skull just below the eyesocket is hardly a marked improvement on one's situation. As for reenactment combat, you shouldn't be thrusting to the face in the first place! In any case, the original owner of the Gjermundbu helm didn't seem to worry much about it, and given that he saw real combat rather than mere play acting ought to serve as a clue that this alleged "drawback" to the design is blown grossly out of proportion. 2. Cheek-guards are not much of a stretch at all. While the actual artefact finds of such belong to before and after the Viking Age, there is at least one artistic depiction from the Era (the Repton Stone, I believe) that clearly shows a helm with cheekplates. And Grettirs saga tells of events from the Viking Age, so even though it was written down long after I do not think it necessarily wrong. To be perfectly honest the Gjermundbu helm may originally have had cheek plates attatched to the rings on the side but none were found. 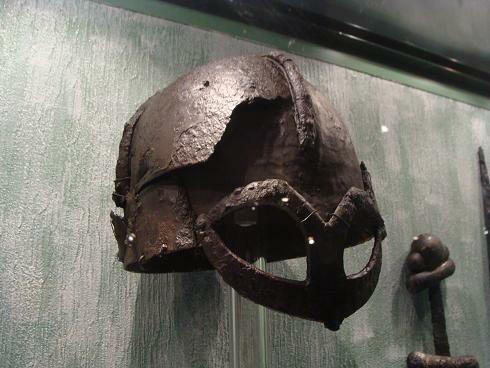 Cheek plates are seen on earlier Roman helms and on Vendel period helms, the only helms from the Viking era we have are the Gjermundbu helm and the Wenceslas helm. 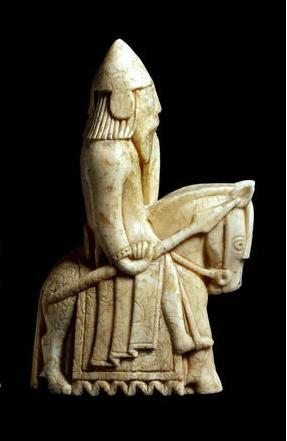 The some of the lewis chessmen appear to have cheek plates as well. 1. Spectacles are fine. What the proponents of this quaint, Ivory Tower theory fail to consider is this: how much "safer" is it to have, say, a spear thrust into your face when you're *not* wearing a helmet? For re-enactment purposes I agree with this one entirely. A blunt spearhead hitting the spectacle is guided towards the eye socket. I have seen this first hand and is the reason I refuse to wear one for re-enactment combat. Real life sharp spear on the other hand then the difference between a hard strike to the cheek and eye is fairly moot (though to be fair the cheek has a bone under it preventing major trauma, even a minor contact to the eye will take you out of a fight). Must admit this particular helm is a little bit of an enigma to me, if the spectacle was used to suspend a mail face-guard (as per the valsgard example) then it makes perfect sense, otherwise it's just not big enough to make a real difference to facial protection. All right, I reverse my judgement for re-enactment combat (only) - though one could remedy this flaw by the addition of an admittedly a-historical addition of a ridge around the eyesocket area, like one sees on the Pembridge helms for example. Hard to say about the Gjermundbu helmet's historical usefulness. I suppose we could just do what others do with the Vendel helms and just say it was never intended for battle and only for marching around in endless parades (sans any hard evidence for such - indeed, with all of these alleged "parades" one wonders when anybody found time to have a good old fashioned battle... but, I digress). Then again, perhaps it was good enough as it was. Who knows?